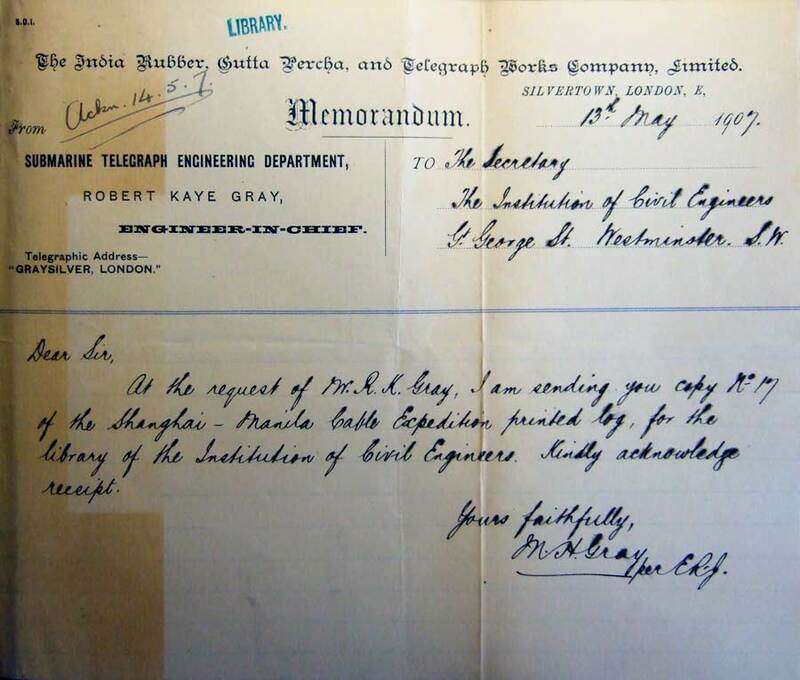 Introduction: The India Rubber, Gutta Percha, and Telegraph Works Co., Limited made and laid many cables. For many of its new cables, and also for some repair expeditions, the company produced a hardbound record book of the project for distribution to its engineering staff and that of the client. It’s not known how many copies were printed of each volume, but some of the books were numbered on the cover and the highest number seen so far is 23 (see table below). The run of each title was obviously not a long one. Almost all the books so far examined have the same general format: a preface giving an overview of the scope of the project; details of the ships used and their personnel; technical specifications of the cable and its loading on board ship; a detailed record of the soundings taken prior to laying; a general log of the day-by-day laying of the cable; the engineer’s log of the laying; and reports of electrical testing and performance of the cable. Supporting material is presented in each section as appropriate. For a short cable the book might be 150 pages or so; for a long run, such as the 3000-mile cable laid in 1881-1882 for the Central & South American Cable Company, the book is over 500 pages. Extracts from this C&SA book may be seen on the page for that cable. This list of IRGP cable report books includes all copies located to date, but is by no means complete. It is derived from the holdings of the Library of the Institution of Civil Engineers in London (ICE), the University of Illinois (UI), the University of Glasgow (UG), the Library of Congress (LC) and the Atlantic Cable Website (AC). Publication dates are not given in the books, so the dates are those of the expedition(s). The numbers shown below are the ones recorded in each library’s catalog or observed on the book’s cover. Transmittal letters tipped in to a number of the books examined at ICE show that the copies were presented in some cases many years after the conclusion of the expedition. 24 volumes are listed for projects between 1881 and 1907. Some are available in full text at Hathi Trust as noted. If any site visitor knows of additional volumes, please email me. 1881 Havana-Key West Repairs : General log, S.S. "Dacia" : from 11th April, 1881, to 28th July, 1881 / kept by W.F. O’Brien. 206pp. Published:	Glasgow : M’Naughtan & Sinclair, printers. A detailed log of the repairs to these cables, with much useful background information. Not the same format as the following volumes. 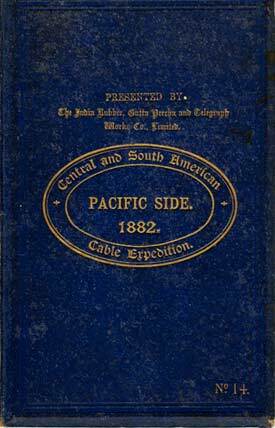 1881‑82 The Central and South American Cable Expedition, 1881-1882. Pacific Side. 1883‑84 The Spanish National Cables. 1884. Three volumes: Vol. I Cadiz-Canary Islands, 1883; Vol. II Cadiz-Canary Islands, 1884; Vol. III Tenerife-Senegal, 1884. 1884 Tenerife Coast, St. Louis-Yof Bay, and Dakar Underground Cables. 1885-87 Soundings taken by the India Rubber, Gutta Percha and Telegraph Works Company Limited: 1885-1887. 1886 Second West African Expedition. 1886. 1887 Congo repairs. SS. “Buccaneer.” 1887. 1890-91 Central and South American Extension. 1890-91. 1891 Western and Brazilian Cables Expedition. 1891. S.S. “Silvertown”. 1893 The Central & South American Cables Expedition. 1893. 1895‑96 Cuba Coast Cables Expedition. 1895-1896. 1901‑03 Weston-Waterville, Havre-Waterville and Waterville-Canso Cables. Repair Expeditions for the Commercial Cable Company. 1901-1903. C.S.S. “Buccaneer”. 1907 New York-Havana Cable. 1907. C.S.S. “Silvertown”. The ICE call number for all these books is 621.315.28, and most are located in the Tait Room. A catalogue search on this call number will also show other books on submarine telegraphy; to find only the IRGP books search on “gutta percha”.